Product prices and availability are accurate as of 2019-04-16 03:11:28 UTC and are subject to change. Any price and availability information displayed on http://www.amazon.com/ at the time of purchase will apply to the purchase of this product. 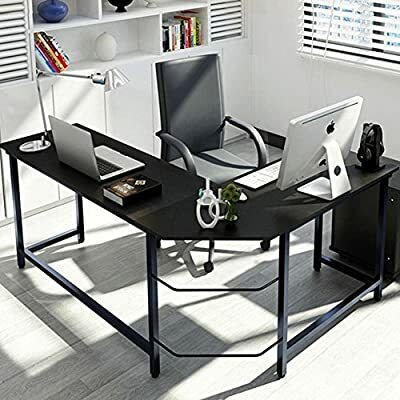 This simple design l shaped desk includes two rectangular desktops (one 49.21" and the other 47.24" in wide) and steel metal legs, which all join together in an L shape for abundant surface space and compactly placement in a room's corner. Safety round corner design with adjustable leg pads, which make the table keep stable even on uneven floor. For CPU storage, a free CPU stand is provide. M-style buckle design,which make it very easy to assemble. ?Bevel edge angle design?perfect to storage your wires, no mess any more! ?Supports multiple monitors and desktop computers without concern of collapsing. -Overall Size: 66.14"(L) x 49.21"(W) x 29"(H) ?as picture show? -Height from floor to desktop: 29"
We provide 18 months warranty only to OEM "Tribesigns" Product , please pay attention to it before purchasing, thanks!